My friend Heather Webb’s book design is being revealed today! 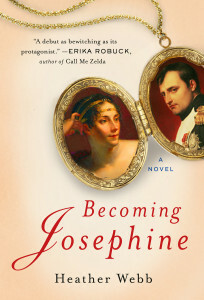 The novel is BECOMING JOSEPHINE and, appropriately, Josephine and her famous husband Napoleon are featured on the cover. You may remember my post about the popularity of cochineal used to darken lips through the centuries…well just look at Josephine’s juicy red lips here to see it in action! Heather Webb’s debut is a novel about Napoleon’s empress, a woman in search of eternal love and stability, and ultimately her search for self. It releases December 31, 2013 from Plume/Penguin. Stop by Heather’s blog Between the Sheets and leave a comment for a chance to win a $20 gift card to Barnes & Noble or a $20 gift card to Amazon. Pre-order her novel (present a receipt) and win a Josephine hand mirror with a velvet bag. I think I’ll have to invite Heather Webb for an interview at release! Becoming Josephine has already been featured in a Wall Street Journal piece on the popularity of historical fiction featuring the wives of famous men. My pleasure, Heather! And congrats!